Urgenthomework.com is the best place for those who do not want to miss the fun and amusements of the college life and yet want to maintain the good grades in the examinations. This is an online education website through which any students from any college or university can get regarding their college projects or homework or assignments. From school level to undergrad as well as post grad level we have highly trained professional assignment helpers to help you regarding any kind of assignments for any subjects. Many students don’t feel the instant need to seek online help, regarding the assignments. Since it’s quite a big change, graduating from school and beginning a whole new circle in college, students need some time to adjust and cope with the changing surroundings. At the same time students are excited to take the big leap and face the real world and becomes worried about their grades. For the first time in their lives college represent the crazy macrocosm of the world out there. College symbolizes the ultimate freedom, no curfew times, new dresses, new hairstyle, living on your own, new friends, new books, everything new. This big leap affects the students in a very influential way. They tend to suffer from the dilemma, whether to make new friends and hang out them, to be ‘cool’ or geeky or ‘nerdy’ or change everything old and so on. Amidst this the reality strikes in the forms of exams the result of all these may prove to be fatal for some, hence the need for online guidance. As it has been mentioned earlier this education portal has specially trained tutors for different subjects. From Mathematics to Chemistry, English to History, Computer Science to Psychology. This assignment help website have different assignment helper for each subject. Students can ask them any questions through mail or live chat since they are 24*7 available. Apart from completing their assignments with the given deadline the students can prepare themselves for the examinations through mock tests, online quiz and such. The assignments or the dissertations, essays whatever the demand is, all of these will be plagiarism free, well debated, and well discussed. The best part about this assignment writing service is that this is affordable and reliable. Apart from the particular assignments the tutors here also help the students by giving guidance. The students can also get their assignments reviewed by the tutors. Along with the particular assignments the students can also ask any questions related to their syllabus so that their consumption of knowledge will not be restricted to the prescribed syllabus only. Whatever the tutors teach they teach in a friendly, student-centric and interesting way which can make even apparently ‘boring’ and ‘dull’ subjects much more interesting and exciting. 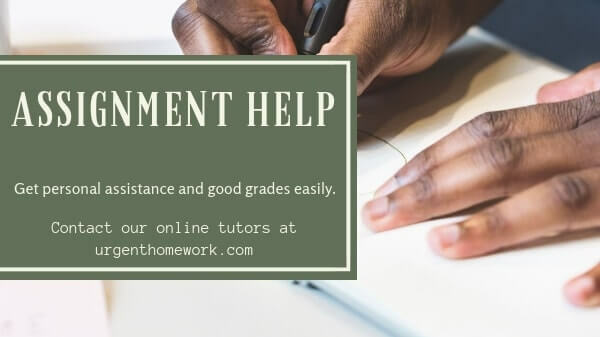 Since it’s not always possible to gain personal assistance in a class among other students urgenthomework.com is providing the students the chance to get what is best for them. After all the one and only motto is to satisfy the needs of the students.